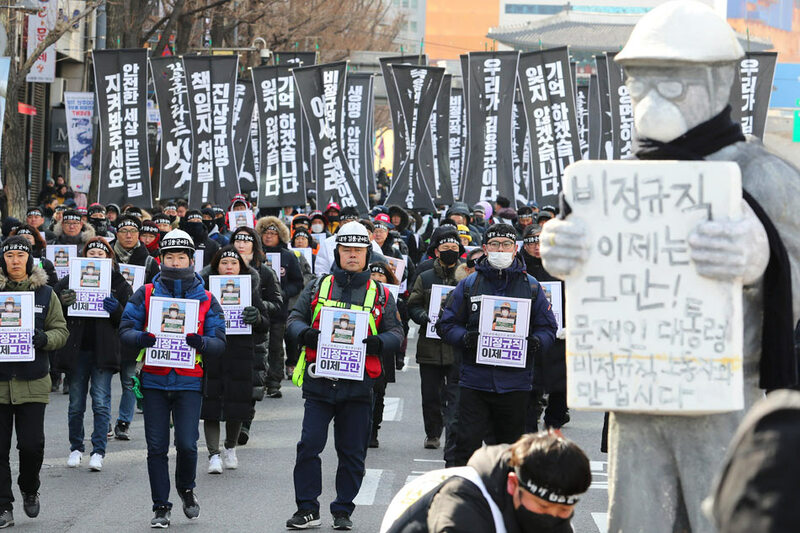 Some 2,500 South Koreans marched through Seoul Saturday to honor a worker who was crushed to death at a coal plant fueling an outcry which led to a landmark amendment of the nation's industrial safety laws. Kim Yong-kyun, 24, died last month after being sucked into a coal conveyor belt. He was working as a contractor at a power plant 110 kilometers (70 miles) south of Seoul. Labor activists say if Kim had not been working unaccompanied, another person could have saved Kim's life by turning off the conveyor belt. Kim was the ninth subcontracted worker to have died from work-related injuries at the Chungnam plant in Taean since 2010. According to labor ministry data, 1,957 South Koreans died of work-related injuries or diseases in 2017.